Conventional tree breeding is a long and time consuming process, particularly for conifers. The normal breeding cycle for Radiata pine is around 32-35 years with backward selection and 8 to 10 years shorter if forward selection is used. Forest owners will always want to incorporate the newest generation of germplasm into their planting stock. Unfortunately, the deployment cycle, the time needed from grafting the desirable germplasm in the seed orchard to the supply of control-pollinated (CP) seeds to nurseries is equally time consuming. PF Olsen has operated a CP seed orchard in Blenheim since 1995. Here is a description of the general process and time needed to bring the best genetics to the forest growers. The Radiata Pine Breeding Company (RPBC) will produce annual breeding values (BVs) around April each year based on analysis of the most recent data from various field trials. New clones that have the best BVs on all or most of the target traits will be selected as seed orchard parents. Scions from the selected clones are collected in June, sometimes from trial trees in the field, and grafted onto seedlings in the nursery. The ramets (copies of the original clone) are planted in the seed orchard in July the next year. It takes two years for the ramets to grow into the size big enough for pollination (see the diagram below). The ramets will produce flower cones two years after planting as they are physiologically aged. Young female cones are bagged before the scales are open so the naked ovules are isolated from external pollen sources. Pollen from a known male pollen donor is injected into the bags to pollinate the female cones. This is called controlled-pollination as the genetic quality of both parents is known. About 10% to 20% of young cones will abort and desiccate after pollination. Surviving cones will remain green and enlarge rapidly. The pollen grain encapsulated inside the seed cone will germinate but the pollen tube stops growing before it reaches the egg cell. The actual fertilisation doesn't occur until about 15 months later in December the next year after the green cones have grown to their full size. The embryos under each scale will develop rapidly over the summer and reach maturity in early fall. The green cones will slowly loose their moisture over the winter and turn brown. Cone picking usually starts in November. Cones are opened by gentle heating and seeds are extracted and cleaned. Cones from different crosses are kept separate and processed individually. It takes about six years from when top clones are grafted in the seed orchard to when CP seeds are available to make seedlings. It takes another year in the nursery before the genetically improved treestocks can be planted in the field. In summary, Radiata pine production is a time consuming process and the key is for the forest growers, especially those that are RPBC shareholders, to engage in the process as soon as the type and level of genetic improvement that the growers want is known. 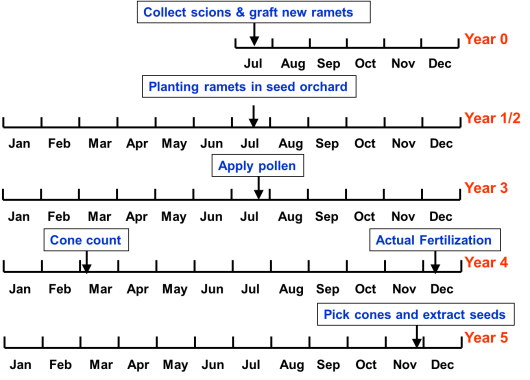 The process and time needed from grafting a ramets to the production of CP seed in a commercial Radiata pine seed orchard. 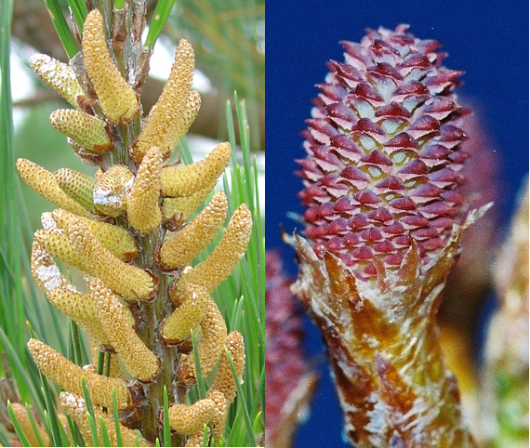 Pollen cones (left) and a young female seed cone (right) of Radiata pine.